Even though there are a million palettes out there that have so many colors in them none of them are ever perfect for any of us. The colors are usually too light and too dark. IT Cosmetics has a beautiful contouring/highlighting palette out that is just right. It is the Goldilocks of contouring/highlighting palettes. This palette comes with six shades: a soft contour shade, medium contour shade and a deep contour shade. It also comes with great highlighting shades too: light contour, matte highlight and radiance highlight. I used the medium contour and radiance highlight for today's look. 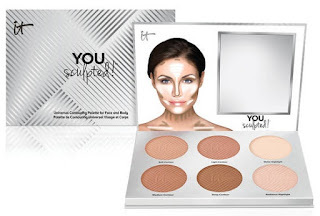 If you loved My Sculpted Face Universal Contouring Palette, the original phenomenon from IT Cosmetics, then you'll love You Sculpted. This is your best-selling favorite with a facelift, and your secret to making contouring easy, whether you're a sculpting pro or trying it for the first time. Developed with plastic surgeons, the leading experts in contouring and aesthetics, each powder shade is formulated with proprietary Perfect Lighting™ Technology to mimic real facial contouring and provide a foolproof alternative to fillers. While the four contour shades absorb light and minimize the areas to which you apply them, the two highlight shades enhance features you want to pull forward, creating the appearance of more volume. Talc-free, and perfect for all skin types and skin tones, these shades are infused with anti-aging collagen, silk and peptides to blend effortlessly and deliver smooth, natural-looking coverage that lasts all day. As an added bonus there is an included how-to guide to make sculpting your most beautiful you easier than ever! Follow the How-To-Contour Booklet inside your palette for reference. 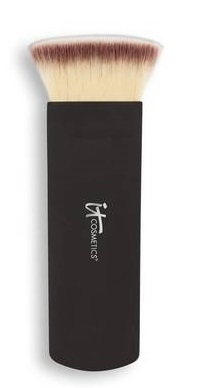 Using your IT Cosmetics Heavenly Luxe You Sculpted Contour & Highlight Brush #18 ($34.50), dust one or more of the contour shades (should be 2-3 shades darker than your skin tone) onto areas you want to minimize. Next use the highlight shades to bring your favorite ares forward. Highlighting attracts light and gives the look of volume and lift to areas such as the bridge of your nose, top of cheekbones, center of forehead, below brow bones, and center of lips. Blend well to complete your most beautiful you. The Heavenly Luxe You Sculpted Contour & Highlight Brush #18 retails for $34.50 and can be used with the You Sculpted Contour and Highlighting Kit or can be used with something else. Whether you’re a pro or just learning to contour, the Heavenly Luxe™ You Sculpted!™ brush is your secret to making contouring easy—and enhancing your favorite features! Custom-designed with a hand-cut brush head, award-winning Heavenly Luxe™ synthetic hair and ergonomic handle, it delivers a precise, even stroke, which is ideal for giving you your most beautiful, naturally defined cheekbones and more. This must-have, high-performance brush does the work for you to deliver flawless, airbrushed results every time! For your most beautiful you, pair your Heavenly Luxe™ You Sculpted!™ brush with You Sculpted!™ Universal Contouring Palette for Face and Body, as well as your favorite IT Cosmetics™ bronzers, blushes and luminizers. Contour your eyes, too! Highlight shades double as eyeshadow base colors, and contour shades double as crease and lid shadow colors! Use your IT Cosmetics™ Heavenly Luxe™ You Sculpted!™ brush for flawless contouring every time, because the brush does the work for you! Both of these items can be found and can be purchased online at www.itcosmetics.com and at www.ulta.com, www.qvc.com,www.sephora.com and anywhere IT Cosmetics is sold. Like IT Cosmetics on Facebook:https://www.facebook.com/itcosmetics; Follow IT Cosmetics on Twitter:@itcosmetics; Follow IT Cosmetics on Snapchat:https://www.snapchat.com/add/it_cosmetics; Follow IT Cosmetics on Pinterest:http://www.pinterest.com/itcosmetics/; Follow IT Cosmetics on Instagram:https://www.instagram.com/itcosmetics/ and Subscribe to IT Cosmetics on YouTube: https://www.youtube.com/user/itcosmetics.